Post-op recovery threw me into all of my zones of discomfort. The surgery was minor, recovery time relatively brief, but the discomfort was enormous. The physical discomfort was tolerable with a few pain killers and Advil. But the discomfort in the socio-emotional spheres was damn-near intolerable. Even as I play that harp, I know allowing is challenging. I am aware of the energy it takes to make peace with cruel or thoughtless words and acts. I play the harp well and I mostly live the tune. For a couple of days after my surgery, I was failing at my most convincing harp tunes. I was pissed because my surgeon didn’t warn me how painful recovery would be. I was pissed because I had to allow myself to be helpless (I truly had no choice) as my daughter and a couple of friends made sure I was safe, hydrated, nurtured, and, importantly, that the plumbing was working properly. I was pissed because I couldn’t get up and go as I pleased. Luda was found by a friend of a friend. She liked to roll in stinky stuff, catch rodents and eat bird seed (and poop with bird seed in it). She loved to crunch on ice cubes, and she danced the cutest two-foot dance when she wanted to be fed. We will miss her. On the third day, just as I was beginning to feel a little more at ease if not more independent, Luda, our first family dog, started behaving oddly. She was still wagging her tail, so we opted out of the only available vet visit that day. 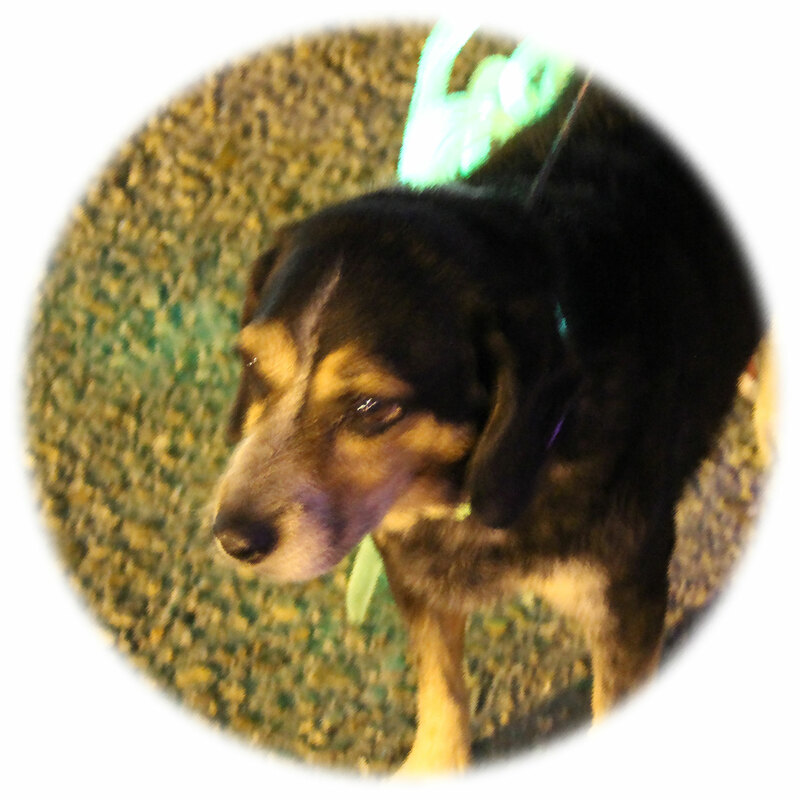 By evening, I realized this beagle-blue healer mix was breathing just like our mother cockatiel Annie did on her last day. My heart sank, then it sank deeper: I couldn’t invite Luda onto my lap. I couldn’t even bend over to pet her. I couldn’t be the one to go with her to the animal hospital. The hospital called me at 2:20 in the morning. Luda had died in a breathing tent there. I had to allow her to slip away without a lap cuddle, without sitting with her like I did for Annie. I was angry and sad, but crying wasn’t an option with staples stitching parts of my core. The next day, my first day home alone, our first foster fail had another seizure. This happens about once a month (that we know of), and I normally lie on the floor and hold her to protect her from hurting herself during the seizure. This time I couldn’t. Core staples. That distress was soon left behind by the stress of witnessing a “limp” seizure. She looked dead. After almost 20 minutes of my gentle foot nudges, she wobbled up and out. I’m still suspicious that that seizure changed her more than any previous (much more violent) ones. That night, to most of the city’s delight, it snowed. I wasn’t expecting a snow, so the weekend before my surgery, I had done nothing to prepare for it. My garden and my pots of peppers were exposed. The power went out for 36 hours. I sat from my recovery chair watching the white dusting of snow and cold choke my plants. To salvage what they could, my daughter and my honey dragged some of the plants onto the back porch and ran water over the plants that were in beds. They boiled pots of water on our gas stove and pulled out camping equipment to warm the air so our cockateils wouldn’t freeze to death. I sat. I watched as others took care of a problem because I couldn’t. Maybe because I fiercely play that harp of allowing and forgiveness. Maybe because I find it so simple to apply in most of my situations and so logical when I harp at others about applying it. Maybe because I shouldn’t play the harp at others. Maybe because I needed a reminder. Part of allowing is allowing your own ugly feelings and process. Part of allowing is allowing yourself to face emotions that can’t be digested at that moment. And part of not taking anything personally is not taking your own shortcomings personally. Part of the tune is allowing yourself to recover even as you shake your fists at the pain. The process trips over and folds into itself, but on the other side of it is forgiveness for what we didn’t like and couldn’t control and hope as we embrace what we still have and can take forward. This is an itty-bitty recovery. This recovery is not worthy of sympathy, empathy, or even a blog post. The worthy is in the reminder. The worthy is finding the path on the other side of recovery. ©Copyright Pennie Nichols. All Rights Reserved. 2017. I wish you speedy recovery. I do believe when it rains it pours and we all have to learn to find a place , ask for a helping hand to weather the storm.